I have to admit that though I find this recording fascinating, it is purely for musicological and music history reasons rather than for the performance itself. Herman Max and Das Kleine Konzert present a reconstruction of Mendelssohn's performance of Handel's Israel in Ägypten at the Rhine Music Music Festival on 26 May 1833. 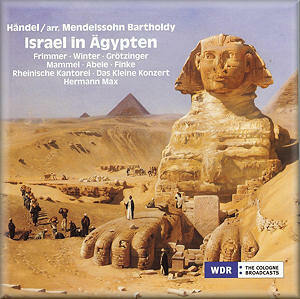 Mendelssohn had quite a history with Israel in Egypt. He performed it in October 1833 in Düsseldorf, in Leipzig in 1836 and again at the Lower Rhine Music Festival in 1842, finally in Berlin in 1844. In 1845 his edition of the work was published as part of a planned complete Handel edition by the London Handel Society. The work had been premiered in Germany in Berlin in 1831 by the Sing-Akademie under Carl Friedrich Zelter, a group with which Mendelssohn had close associations. For their performance, the Rhine Music Festival committee had managed to get hold of a 1792 score of the work which was relatively accurate. They also managed to get a set of parts from Berlin; this was moderately essential as the Berlin performance had been orchestrated by J.O.H. Schaum. Mendelssohn would use this orchestration for his performance in 1833 because the venue had no organ. Generally Mendelssohn seems to have been ahead of his time when it came to fidelity to the score. For later performances of the oratorio he used an organ when it was available and dropped the extra instruments. For a performance of Solomon with the Rhine Music Festival he even had an organ transported to the venue. For the recitatives, Mendelssohn used two cellos and a double-bass. The original parts are divided into solo and ripieno, essential, you imagine, as Mendelssohn was conducting an ensemble of some 275 singers and 134 players in the orchestra. Mendelssohn was quite keen on returning to the authentic score and used visits to London to look for original sources of Handel's oratorio. His critical examination of available historical resources marks him out from his contemporaries. The London conductor George Smart showed Mendelssohn a libretto for a performance which was done during Handel's time - this included numbers not in some scores. Also Smart was supposed to have the genuine tempi from his father, conveyed in the form of timings for the movements. These may be reflected in Mendelssohn's metronome markings, but bearing in mind the size of his forces we must doubt whether they relate to Handel's speeds and may relate better to the larger size Handel centenary commemoration performances. Mendelssohn added a number of pieces which he found in London, the most interesting of which for us are the recitatives. These were thought to be Handel's own but probably date from the 1760s when performances were directed by J.C. Smith. Nevertheless they make an interesting addition to the work and it would be well worth other performance groups investigating them. All this fidelity to the score was partially scuppered by the nature of the festival itself. A large number of singers came together for a relatively short time to rehearse the work; as a result there were cuts and shortenings. So that the choruses were not performed complete. Evidently it had been hoped to make this recording with something approximating the forces used by Mendelssohn, but this did not prove feasible. So instead Hermann Max conducts a chorus of 29 and an orchestra of 32 (61 musicians to Mendelssohn's 419). And what of the performance? Well Max's tempi are moderate rather than fast, but the general feel is crisp and incisive. The proceedings open with an overture which Mendelssohn had provided, though it was not newly written. The chorus are similarly lively and quite light-textured. Both chorus and orchestra have moments of instability and uncertainty, leading me to wonder whether a slightly longer recording period might have been favoured. Whilst their performance has its points and is certainly more than adequate, there are other more preferable recordings of the work. When it comes to the soloists, there is a degree of serious disappointment. We don't get the bass duet 'The Lord is a Man of War' and the soprano duet seems to test both the sopranos when it comes to the upper range. There are similar problems in the soprano solos - the booklet does not say which soloist sings which soprano solo. Heike Grotzinger has a pleasantly fruity alto and Hans Jorg Mammel an attractive lyric tenor. Without their duet, basses Ekkehard Abele and Gregor Finke are woefully underused, though all singers get the extra recitatives. The CD booklet contains a long and informative essay giving the full background to the 1833 performance and the edition used by this recording with a libretto with translations. The disc is relatively poor value at 83 minutes spread over 2 CDs and I did wonder whether some way of fitting it onto 1 CD could not have been found. As a performance of Handel's Israel in Egypt (or Israel in Ägypten) this is disappointing. But as a window on early Handel performance practice, it is utterly fascinating.